The program gives drug users free, clean syringes in exchange for dirty used ones. But advocates say it's more than that. KNOXVILLE — A new program in Knoxville aims to reduce the spread of disease and put a dent in the overdose epidemic. The Syringe Service Program allows drug users to exchange dirty syringes used to get high for clean ones, all anonymously and for free. There are already three of these exchange programs around the state, with locations in Nashville, Chattanooga, and Knoxville. 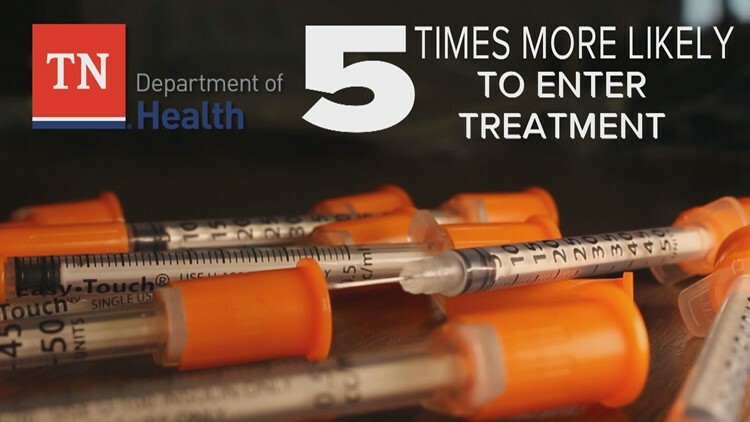 The Tennessee Department of Health says people who inject drugs are five times more likely to enter treatment for substance use disorder when participating in a syringe exchange program. "This is a piece to the puzzle. It’s not solving everything, but it is a piece to the puzzle," said Ernie Hoskins, the Prevention Director for Project ACT in Knoxville. " If you use a syringe again and again, it can get to a point where it rusts. Then we know if you are using syringes with someone else, dirty syringes, you can spread HIV and Hepatitis C."
Project ACT began operating the Syringe Service Program in Knoxville last March. They don't advertise and only receive referrals through word-of-mouth. Once a week for three hours, the nondescript Project ACT van pulls up to a street corner in Knoxville with a bed full of clean syringes and the goal of helping addicts get treatment. The exchange operates only once a week for three hours. In the first three months, they have seen more than 220 participants. "Just during those three hours once a week, we have seen huge success," said Hoskins. "It’s going to take a while I think to build a relationship with someone who may not feel comfortable or safe used syringes back, but we’ve seen week after week that the number that people are bringing back continues to increase." The goal of the program is to stop the spread of blood-borne diseases, get people addicted to drugs into treatment, and ultimately get people off of drugs. "People are going to continue to do their drugs, there’s plenty of evidence for that over many years. If you’re a substance user, that’s what you’re going to do. Until you get a reason and believe that something else becomes a better reality for you," said Dan Ely, the Medical Director for Positively Living, which operates Project ACT. "This is a group of people that largely are not in any kind of medical care. If this is their foot in the door, if this is access to care, it’s a start." Down in Chattanooga, the Syringe Trade and Education Program operated by Cempa Community Care has already given out more than 12,000 clean syringes and taken back 8,000 in its first three months of operation. "The only way they get needles is if I get them back. I want the dirty ones," said Ashley Ewald with Cempa Community Care. "I feel this is the same concept as condom distribution. Kids are going to do it anyway, addicts are going to do it anyway. It's best to give them the opportunity to do it safely." Along with the clean syringes, participants get tools to more safely inject drugs like heroin and meth, including the overdose reversal drug Naloxone. Users are given biohazard containers to put their used syringes in as well as tourniquets, alcohol pads, and filters. 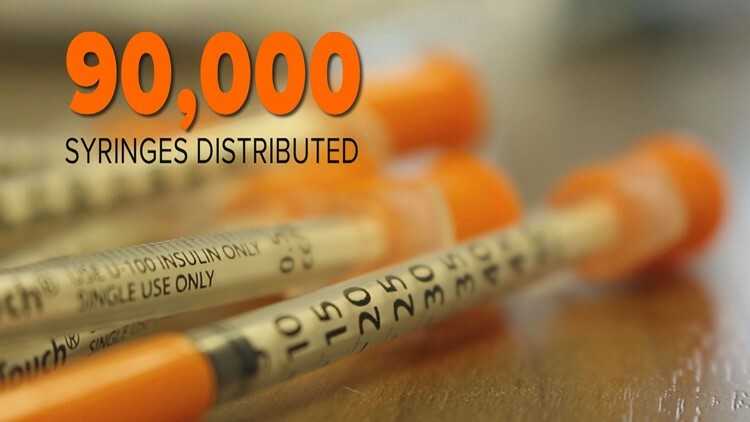 There are syringe exchange programs in 20 states and 194 cities across the country. Last year, state legislators passed a law allowing Tennessee programs to receive federal funding, but would require them to use private grant money to buy the actual syringes. Since August of 2017, 90,000 syringes have been distributed across the state and 24,500 have been returned. "There'll be less chance of seeing syringes being discarded in parks, places where your kids are playing. Law enforcement, first responders, will have less opportunity to have occupational exposure," said Karen Pershing, the Executive Director of the Metro Drug Coalition. "Each time you come in contact with them, you're planting a seed with that person, that we're going to help you if you want to stop using." For law enforcement around the state, agents see both the positive and negative effects. "I can see the benefits of it reducing the potential increase or risk associated with developing HIV, HEP C, or HEP B," said Tommy Farmer, a TBI Special Agent In Charge of the Drug Division and the Director of the Tennessee Dangerous Drugs Task Force. "The other side is, unfortunately, you don't want it to encourage use." Project ACT hopes to operate the syringe exchange program multiple days a week for longer hours within the upcoming months. They also hope to expand their services to more rural counties. As Knoxville continues to see people die every day from drug overdoses, advocates hope this program may provide a life line to those desperate to get their next high. "It's going to take a while I think to build a relationship with someone who may not feel comfortable or safe used syringes back, but we've seen week after week that the number that people are bringing back continues to increase," said Hoskins. "We have to meet people where they are." You can contact Project ACT here, and see resources from the Metro Drug Coalition here.